Twelve-year old Sarojini lives in urban Bangalore with her mother. The father is absent, having abandoned the family ten years earlier. In Sarojini’s words, “He might have started another family, probably with a lot of sons. Amma never talks about him. And I don’t ask.” Amma works in rich people’s houses, struggling to make ends meet and determined that her daughter should get an education. The novel plays out in letters that Sarojini writes to her long-dead namesake, the freedom fighter and poet Sarojini Naidu. Obviously there is history and backstory aplenty here, giving rich context to the protagonist’s own ordinary life. In this context, the epistolary form is a skillful choice. Because of the form, and especially because of the young letter-writer’s clear and resonant voice, historical and family backgrounds do not for a moment interrupt or overwhelm the main story’s progression. I’m a girl and he’s a boy. I’m a Hindu and he’s a Muslim. I’m an only child and he has two brothers. When Amir moves to a new private school, however, he appears to have crossed a great educational divide that can’t possibly be bridged. The system, set up to get poor children into good, private schools, is so enmeshed in corruption and bribery that the latter seem unavoidable. And so it happens that when Sarojini’s strong internal sense of justice and fairness run headlong into nasty reality, there’s a mechanism of coping the novel sets in place for her. With nowhere to turn, and when the school letter-writing assignment comes to an end, Sarojini just keeps on going. She can’t seem to stop writing to the late Mrs. Naidu. What begins as a school assignment becomes the life-changing journey of a most endearing narrator. Sarojini bends her energies toward efforts to implement a law mandating a quality education to students attending government schools. It’s a transformation that feels both completely logical and plausible even while being pitted against impossible odds–a perfect fictional conundrum. Sarojini’s story is enriched by a loving and loveable cast of secondary adult and child characters–her friend Amir, her irrepressible ally Deepti, and the aunties–acting individually and as a bloc. Amma and Vimala Madam come to life as well through Sarojini’s evolving narrative. As she comes to inhabit her own life more fully, she in turn depicts them, in her letters, with increasing subtlety. technically, you are not like other adults. Did you ever losegive up hope, Mrs. Naidu? Inspiring readers to take action in the real world? In my adult mind, I hadn’t made that particular leap, but there it was, from a reader of Sarojini’s age. The most profound message underlying this gentle, funny book is that you can only change your world if you have the courage to change yourself first. Subramanian manages to convey this vital connection between personal integrity and social change without, in the least, being didactic. Delivered in a child-sized package, the book never condescends to the reader. 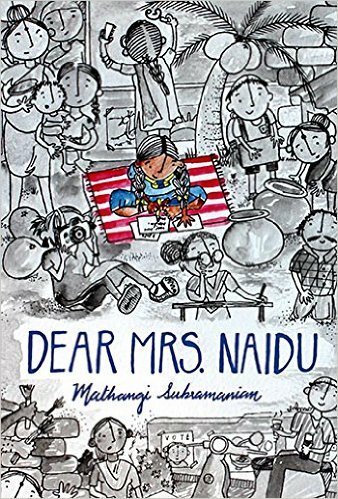 The genius of Dear Mrs. Naidu lies in the clarity and conviction of its young protagonist’s voice, in its clever twists and turns of plot and motivation, and, above all, in its pitch-perfect depiction of a very particular, idiosyncratic community of people. I found it a delightful read. Mathangi Subramanian is an Indian-American author, educator, and activist who splits her time between Delhi, Bangalore and Washington, DC. She has been a public school teacher, a policy advisor, a children’s media specialist. She’s also the author of Bullying: The Ultimate Teen Guide. 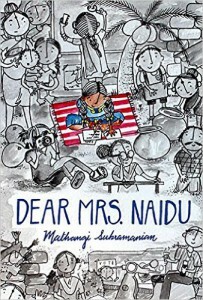 Dear Mrs Naidu is her first novel. Uma Krishnaswami, the reviewer, is the author of over twenty-five books for young readers, including picture books, chapter books, early readers and middle grade novels. Her chapbook, Book Uncle and Me, won the Scholastic Asian Book Award and the Crossword Award in the children’s category. Uma lives in Victoria, British Columbia, Canada. 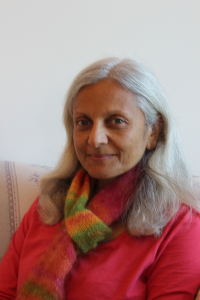 Uma is on the MFA (Writing for Children and Young Adults) faculty at Vermont College of Fine Arts, Montpelier, VT, USA.